Since Jan brought the subject up today, I thought I would blog about toad frogs today. These would fall in the category of “things that make me smile” or favorite things, a topic started by Ronda. I was going to do a whole post of things, but haven’t seemed to find time, so I will just sprinkle them out over a few blogs, here and there. 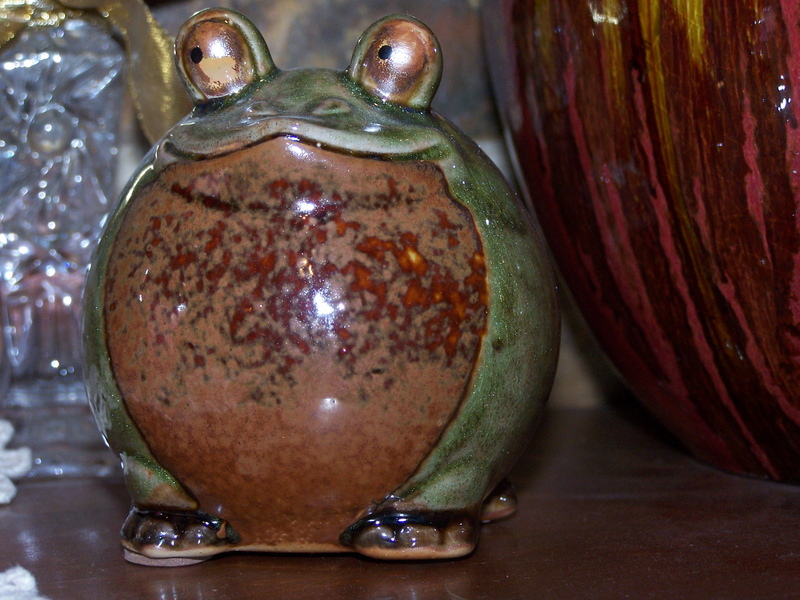 My love of toads is one of the reasons my DH says I’m a simple woman. 🙂 I can sit outside and watch the toads on the patio and be completely amused. And yes, I’ve taken pics of them. This one I referred to as Mr Green Jeans, as he was more green in color than the others. These pics are from a couple years ago. It was a good toad year. On a good night, I would have around 15 toads on the patio. I even turned on the light to attract more bugs for them to eat. Before DS could mow, I would go around the yard, collecting them in a bucket so he wouldn’t run over them. I know…you are shaking your head right now, thinking, “is she serious?” Yes, I’m afraid so. This is a little trait I have that drives my DH & DS a little nuts at times. And when I comment that I can’t find a particular one, that’s when DH says “are you serious? You can tell them apart now?” Sigh…. These cuties are indoor toadies. I bought this one just because he’s cute and he makes me smile when I look at him. This one is special because he was a gift from a friend. She got him for me to put in the yard, but he is so cute, I kept him inside, where I see him more often. 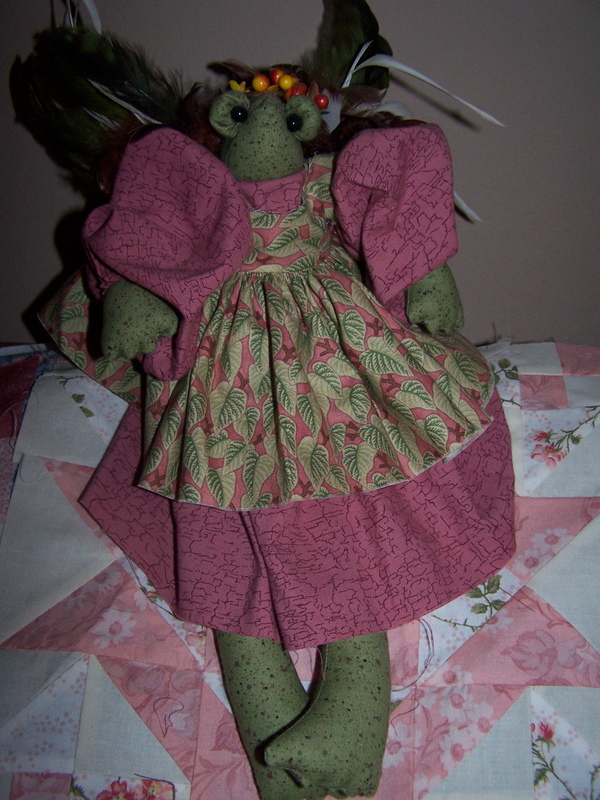 And this one, Dodie the Toad Fairy, is very special because she was made by one of my online quilting friends, Peggy H., from Montana. I was fortunate to be able to purchase Dodie from her. Isn’t she too cute? Now then, I think I shall go clean the kitchen up from dinner, and hopefully, the thunderstorm we are having will end, so I can go turn on Corky, my quilting machine! We just got about three inches of rain in the last 1.5 hours. I am working on my Mom’s quilt, and had hoped to work on it some right after I got home from work. But, that’s right when the storm came. I am having a little trouble with the last border. It looks a littly “wonky”. Could it possibly be my piecing???? Surely not! 😉 Oh, I hope it looks ok after I get it off the machine. See! I told you it would have been better if you had taken the pic!! 🙂 I bet it looks fine when you take it off the machine. I like simplicity….. it’s right up my alley. 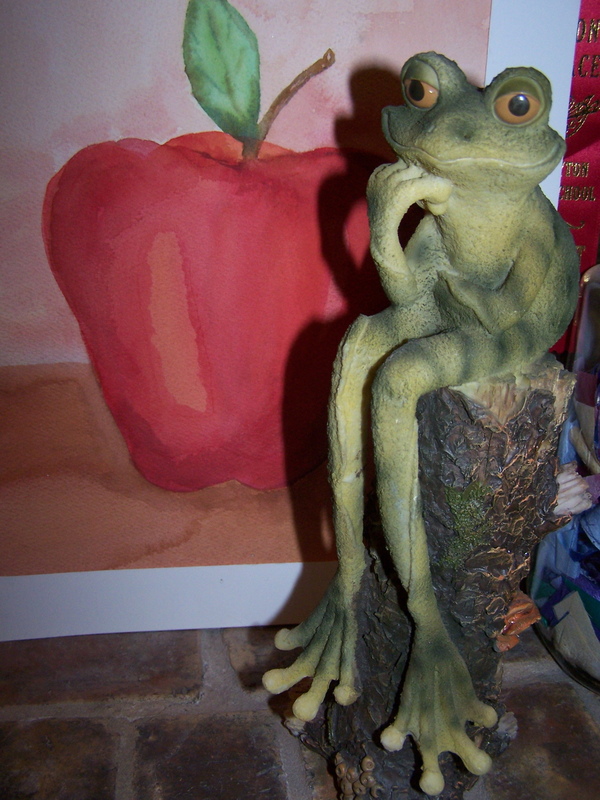 Love the frogs………….well maybe not so many of them on my porch. But I would hate to have dh run over any either. They are fun to watch tho. 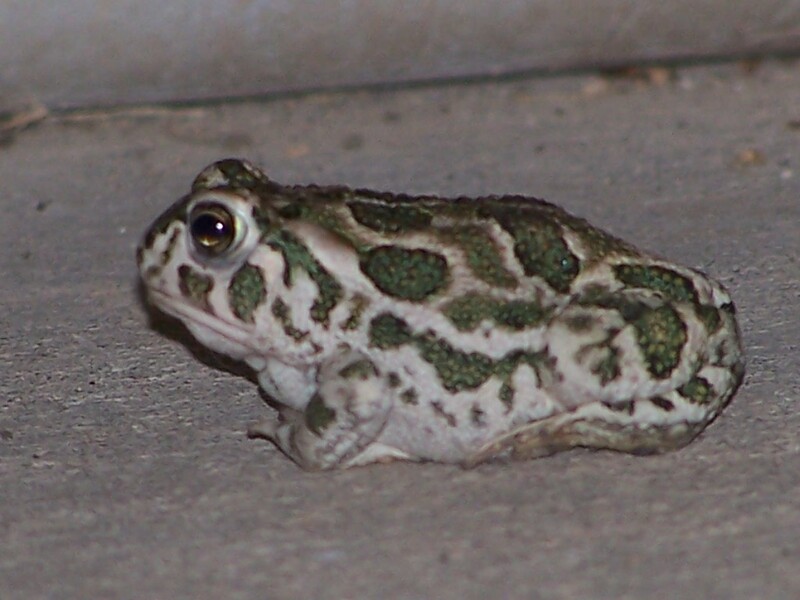 Great toadies – indoors and outdoors! I have to rescue some from the pool every morning! And there is a HUGE one that lives in the front flower bed. Here we also have lots and lots of tree frogs which sing all night and can sometimes keep me awake. And with all the rain this year they have gotten very very BIG!! i’m afraid of toads….not really. well maybe if i was covered in them. i guess i don’t LOVE them but i’m glad someone does! 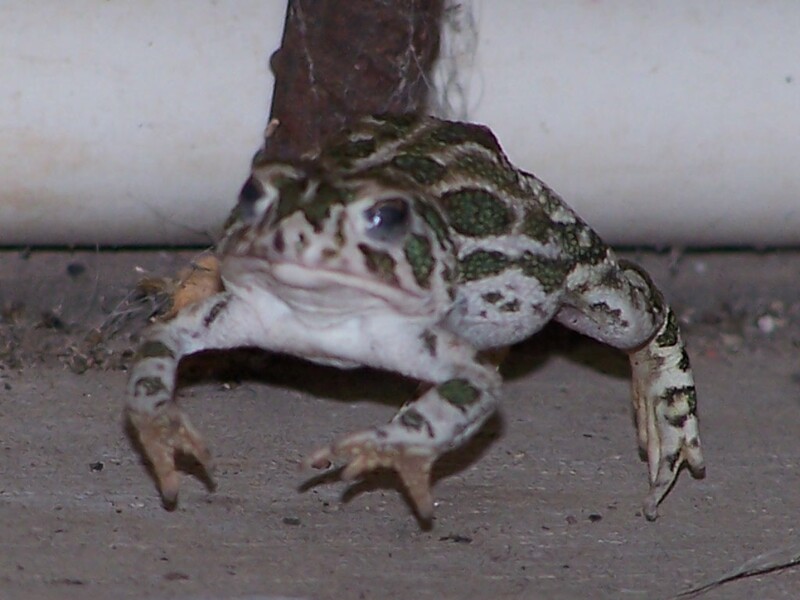 May I join DH in saying “Are you SERIOUS?” I have a long history with frogs/toads and not a very happy one. But being a gemini (whenever I’m of two minds, I blame it on being a gemini), I am both deathly afraid of them and fascinated by them. Deathly afraid means nightmares and fear of death if one should touch me (don’t know why one would, but there is no reason in this feeling). Fascination means hooked on watching them, even if it means the one in our tiny little pond outside the front window that just sits. I love the sound of them in the evenings and after a rain. I am happy when I hear them and see them (over there, way over there–or on the other side of the window) because I know that our little bit of ecosystem is somewhat healthy. But please, please, don’t surprise me in the garden or move in with me (we had toads/frogs on and IN a very small house we lived in once–the tiny green ones climbed the porch post to jump into some hanging planters and the larger brown/grey ones came into the house and watched while I edged past to get to the bathroom). In any case, thank you for rescuing them from the mower. Mown frogs/toads is an image that makes me cringe even more than that of them hopping around on the deck! Is that too graphic–sorry.) Yikes. I love your frog collection. I will always watch for them from now on when I mow. I enjoy your blog! « A butterfly, good food, and more FABRIC??! !